How we funded Rebelle: a li'l preview of Bitchin': Money Moves! We’re doing another btichin’ panel on Monday, March 25 here at Rebelle. We’ll be talking about money. Nobody likes to talk about money. We’re trying to do more of it. I’ll be moderating our next talk, which means you can expect really provocative questions! Since the rest of the ladies will be sharing their stories, I wanted to share mine with you through this medium, to preview the kind of conversation I want to drive at the panel. Hope you’ll be joining us! Tickets are available here. Me in our pop-up days, right before we opened the shop (Summer 2017). Photo by Francesca Gallo. According to my early records, it cost me $3,376 to start Rebelle, spent from the time I started testing recipes (my first expense was a baking stone from Amazon) to our first pop-up on January 22, 2017. I know this because I tracked it all religiously on a Google sheet. I had $3,376 because of my prior job, where I made a salary that is still to me a lot of money, over $100,000 per year. (Ugh it feels really gauche to put this so openly. Let’s get over this icky feeling when talking about money.) I have never had a lifestyle to match that salary. We eat out regularly but don’t have expensive taste. We drive “normal” cars and didn’t buy new ones when the old ones were paid off. I travel on a budget. I only started buying clothes at full price recently. When I had my corporate job, I was saving about 40% of my take-home pay every month. After 2 years, I had about $70,000 in a savings account, plus various other smaller amounts scattered among brokerage accounts. (I thought I could pick stocks. That’s funny. Don’t try picking stocks.) I wasn’t saving with a goal in mind; I just didn’t see a reason to spend the money and I knew one day I could use it for something, I just needed to find the right “something”. Maybe I’d decide I really needed to travel and see the world, and I had this pool of money. Maybe one day I’d hate my job. Maybe I’d need an escape hatch out of my life. Money is a powerful tool to have. I used this money when it came time to build our storefront. In April 2017, I signed my lease for the Doyle Ave space and drew up a budget for a buildout. Darcy (then my boyfriend, now my husband) and I sat at the kitchen table before we signed the lease, tallying up how much money each of us had in various accounts. We wondered if you could build a store for that much money. We put accounts in “buckets”: money we feel very comfortable gambling on this; money we’d rather not lose but we’ll survive if we do; money we can’t afford to lose under any circumstances. We came up with $135,000 as our budget for building and opening this store. That had to include everything, down to paper napkins. Looking at our books today, we pretty much nailed it down to the cent. But there were a lot of compromises made to stick to that budget. We pieced together that amount through selling off stocks to liquidate some brokerage accounts, Darcy loaning the business some money (I was hell-bent on owning 100% of the company and not taking investors), me opening and maxing out a business credit card, help from our landlords and $27,000 raised through Kickstarter. I had to make a lot of compromises to build and open my store because I had a relatively small budget. (Nice places spend about twice my budget for a similar size space.) We have vinyl floors because I had no money to rip up the floors and rebuild them. I don’t like our floors but I am stuck with them and we make it work. (And I anxiously await the day I won’t wince at a quote to rip them up and replace them with tile.) We couldn’t afford to hire a design & build firm, so my contractor and I designed it together as well as we could within my budget, I got a bit of help from Maddie Ballon on interior design, we made creative use of IKEA products, and I did a fair bit myself (painting, finishing counters and decorating). We still do a lot of DIY. Sometimes I feel self-conscious about it and wonder if we should spend more money on things made by professionals. But I also really like to look around the room and admire what we have literally built with our own hands. There is a little piece of me in everything here. Now we’ve been generating a nice profit and we run the business like a tight ship. I look at our financials obsessively. There’s very few things you can ask me about the performance of my business that I don’t know the answer to. I have the best accountant/business advisor (Dean Weinberg is ya boy) and he’s helped me make smart decisions along the way. By some combination of brute force and compelling persuasion, the whole team has adopted our approach of reducing waste in all forms: we don’t waste food or time or money. I pay myself less than half of what I used to make in my old job; my lifestyle hasn’t changed dramatically, and I would rather re-invest the profits into the business and keep this baby growing. Once again, I’m hoarding cash and waiting for the next opportunity. I came up with this idea to make “bingo” cards at the shop when drafting our 2019 goals. I went back and forth between thinking it’s a genius idea and thinking it’s soooooo lame! But I am trying to be adventurous in our marketing efforts. Sometimes the things I don’t think are going to work end up being a smashing success. So I spent my commute home from school one evening designing these and sending them to print. Fingers crossed! This is how it works: Anytime you come in this month and get a qualifying item, you get a punch. (And you’re not limited to one punch per visit — in theory, you could buy all the items and complete 2 online orders in one day and get ALL THE PUNCHES.) 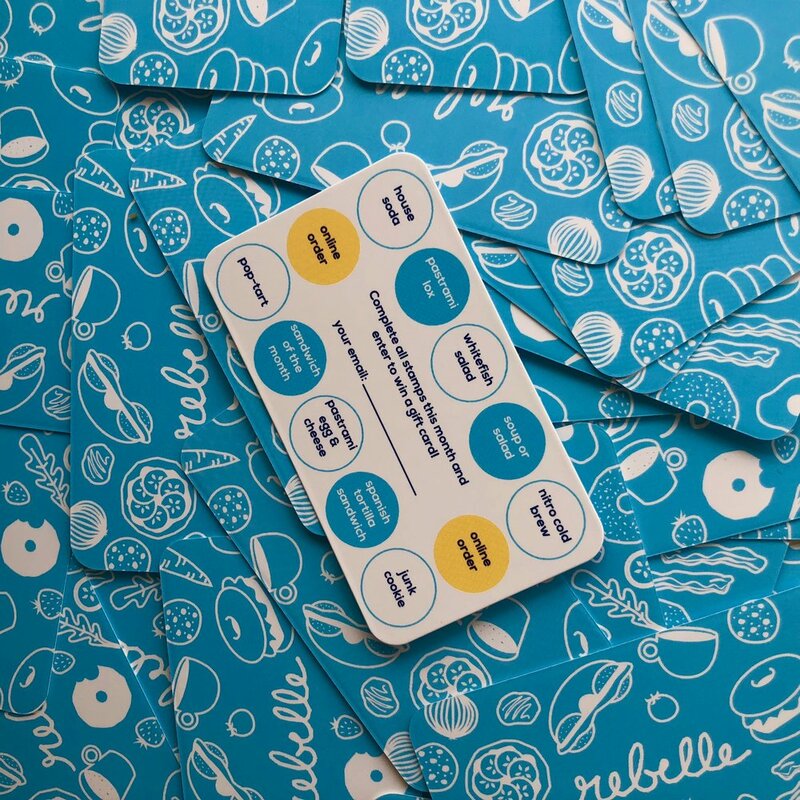 Get all the punches, and you can enter your card into a drawing for 1 of 4 $50 Rebelle gift cards. This is such a numbers game for you, I hope you realize your odds of winning are way higher than you think. According to our data, most people are creatures of habit (though we didn’t really need data to tell you that) and they won’t try something new for the sake of playing a game. BUT YOU WILL! And you will be rewarded handsomely for it. We have a limited number of cards, so only up to 1000 people will be in the pool fighting for a gift card. Obviously not everyone is completing the challenge — I think on the super high optimistic end of things, maybe 5-10% of people will get all the punches. If you’re one of them, that gives you a 1 in 25 chance of winning a gift card. AT WORST. That’s pretty good odds. Where do you get the flowers? What’s the music playing right now? And I am here with the briefest of blog posts (this is 100% filler to be real with you) to give you some answers! The flowers come from The Floral Reserve. You know about Flowers by Semia, right? She’s only the hottest floral designer (?) in RI, and she also happens to own The Floral Reserve, a beautiful space for wholesale flowers. I met Semia through Instagram, as I have met countless other friends, and we arranged for me to buy flowers at wholesale prices to brighten up our shop. Buying and arranging our flowers is hands-down my favorite Rebelle errand, and I do it every Wednesday morning before I head out to school. Semia always works within my budget, and she and her team are an absolute pleasure. The Floral Reserve is open on Fridays and Saturdays to the general public. The blooms are pricier than what you’d get at the supermarket, but they’re more precious and well worth it. The music: curated Spotify playlists by me! I put a good chunk of thought into our music because we have to listen to it all day long. (Also, even though I knew nothing about opening a business, I always noticed how music becomes a part of the environment and brand.) Before we opened, I made the shop its own Spotify account and built a few playlists to rotate depending on the mood/vibe of the day. The music is pretty much what I like to listen to personally, and I try to listen to it as much as I can and weed out the songs that are getting tired. I would describe our soundtrack as the intersection between Millennial Dad Rock (e.g. early works of Interpol, Modest Mouse and The Strokes), Scandinavian Pop Earworms (Robyn, MØ, Lykke Li) and whatever Indie rock we all listened to in college 10 years ago. We bought 2 clicker-counters from Amazon and went to town: DATA! We bought these things last week on Amazon — I’m still not sure on whether they’re called “counters” or “tickers” or “clickers” — and we spent the whole day counting on a Saturday from open to close. Then we went home, poured us some beers, and graphed the data. We learned some awesome stuff. Our methodology was surprisingly low-tech. Darcy had a clicker to count the number of people coming into the shop, and I had one to count the number of sandwiches coming out of the sandwich line. We recorded the data at 15-minute intervals. I annoyed Claire and she was convinced I was missing clicks. I bagged and called out all the orders while I clicked, so I also had a few interesting observations of my own. Now I’m going to do a very awkward written presentation on some graphs I think are cool. Am I the only nerd in the room? Quite possibly. So first up is the data Darcy collected: The number of customers entering the shop at 15-minute intervals. The yellow line is the all-time total of customers for the day, since we opened at 7:30 am to closing at 2 PM. In blue, we have the speed at which customers came in, measured in people per minute. 1) People come in little waves or bursts. It’s not steadily 100% jammed busy all day. We know this already, it’s just interesting to see it in the data. For you my dear customers: Come before 9 AM if you want a chill breakfast. It’s bananas all day after that, until 12:30. 2) We’ve served 50% of our customers by 10:30 AM. That’s wild. The business of breakfast is all about being able to capitalize on this 3-4 hour window when people feel like eating bagels the most. Talk about pressure! This is the data I collected: what I am calling Sandwich Velocity, or number of sandwiches coming out every 15 minutes. You can see it’s wavy like the customer count but not a perfect reflection. Not everyone gets sandwiches, so this makes sense. The first 1.5 hours of the day are very slow on the sandwich line and the team uses it to do their prep for the day — slice cucumbers, stock cream cheese, etc. The goal is that they don’t have to stop and reload their unit halfway through service, because that REALLY slows things down. You can see there’s a big dip on the blue line around 11:30 AM — Claire ran out of bacon and had to get some while Tracy held it down alone. Our sandwich output got slower and tickets kept coming in. We’re brainstorming ways to make restocking more seamless because, let’s be real, we’re going to keep getting busier and we can only stock so much food in the front. Here’s what we did next: We mapped the customer velocity and sandwich velocity on the same time table. Again, the waves are not perfect matches, but you can see the peaks and troughs are offset by roughly 15 minutes. I’m thinking this 15 minutes is, on average, the amount of time lapsed between a customer walking in and receiving their prepared food, inclusive of waiting in line, getting cashed out, etc. This feels like lightning speed for weekend breakfast. We probably could gather more data to study this more closely. But it’s still a super valuable insight. I think this data really helped me see the extent to which we’re busy and the team hustles hard on the weekends. I’ve known it qualitatively because I’m here every weekend, but I had never put numbers to it until now. No wonder we’re poppin’ hard on the weekends — where else can you roll in with a group of 6 for breakfast on a weekend without a reservation and have your food within 15 minutes? Even if we’re off our game and it took 30 minutes from walking in to getting the food, it beats the next best alternative, which is a 30-minute wait at a brunch joint plus a 1 hour meal at twice the price per person. We’re brainstorming ways to lean into this, so don’t be surprised if you see us testing new weekend-only items. Do you have any ideas or insights about our weekend service? Let me know! Soup update: Soup’s taking off! Remember how I wrote about my big soup letdown in December? We took some action and lit a fire under this thing. Soups are now showing momentum! I took the lead on soup making since the semester ended for me (mid-December). I have been focusing on making 1-2 soups per week making creative use of our fridge/pantry/things on sale. All the soups are 100% improvised. The kitchen team has helpfully hoarded scraps for me, including a Cambro* full of veggie scraps to make veg stock. This has been such a fantastic exercise in reducing food waste and being resourceful! As an engineer, I do my best work with constrained problems. Give me a pile of carrot butts, a can of chickpeas and a smidge of tomato paste and I will make you a soup. And it will knock your socks off. So far, we’ve made soups to fit all kinds of dietary restrictions. We’ve worked through a few versions of vegetarian Cheddar Broccoli (and continue to refine it! ), an awesome vegan Carrot & Butternut Squash soup, and a vegan Bean & Mushroom soup that I just HAD to recreate at home because it was killer. We also have a lot of meaty scraps so I just ball out with the chicken stock and butter on those soups, like the Chorizo, Potato & Chickpea soup. Since I last wrote about this (end of year), soups have been moving twice as fast as they were before! I’m not sure exactly which one of my ideas to push the soup did the trick – probably some combo of all things. I had hypothesized that we needed more visibility on the menu with the soup. We installed this brown paper roll thing on the wall for me to write our specials on, instead of having a collection of signs on the counter. I noticed that customers are reading the soup on our menu! Also, when we post bagel updates on our Instagram story, you can see the brown paper menu behind it and read about our soup special. Awesome. We also sent some emails about soup. They definitely drove awareness (people opened the email) but the soup coupon wasn’t a huge hit. Honestly, not an issue for me – I got people to try the soup without giving up any margin with a discount! I’m happy as a clam. I have to get the kitchen to replicate my improvisational approach to soup-making. They do a great job of improvising with the salads, and soup is the next level. I still have Monday mornings off from school this semester, though, so I am actually super OK with keeping one foot in the kitchen by running point on soup. Have I mentioned how much I love making soup?! We’re going to test a soup & sandwich lunch special. Out of the transactions with soups, 59% also had a sandwich. DUH. I’m thinking of testing an always-on “buy a sando, get a soup for $3” lunch-time promotion. You won’t need a coupon or anything! With a blended average price below $6 per sandwich, this is actually going to be a killer deal for you compared with, say, a Panera lunch. (I just looked at their prices, and the average ½ sando + soup combo will run you $10.53.) This will hit in the next few weeks, once we lock down our approach to soup-making without Milena in the kitchen all the time. We’re starting to wonder what else we can do with our soup kettle. Maybe oatmeal? Oatmeal is usually super boring but I gotta tell you, Puerto Rican-style oatmeal is the best comfort breakfast. Made with milk instead of water, runnier than porridge, and almost too-sweet. I feel like that’s going to hit the spot with this cold weather. Tell me: Have you tried our soups? What do you think of my ideas to take soup to the next level? I have never been big on documenting my life through photos, yet I am now experiencing what I imagine parents go through when they realize they don’t have many photos of their babies and now they’re grown up. Lucky for me, there’s Yelp! I pulled a few photos from there to use as a jumping off point for talking about our evolution. I alternate between glowing pride (we’ve come so far!) and cringeeee (yikes, our place was so barebones!). Follow along on this emotional rollercoaster ride with me! photo by Yelper Ken Z from September 2017. Our menu was incredibly limited! I don’t think anyone understood this, and to be fair I did a very bad job of setting the right expectations, but all I wanted to do when we opened was literally the exact same thing I did at pop-ups, and build on it slowly. I had never run a restaurant, opening one is pretty daunting as it is, and trying to offer a full menu with my limited experience would be the quickest, surest way to fail. I think time has proven me right on my approach, but for the first 6 months I don’t think many people understood what we were building up to and everyone was frustrated with… everything, really. But the people who did get it? I ADORE my regulars who’ve been coming from our early days. Thanks for putting up with me. Originally, I wanted to change the cream cheese flavors every week just as we did with the pop-ups. This was a terrible idea. People were coming in and loving the Bacon Chipotle cream cheese, and then they’d tell friends to come in and try it, and the friends would come and we wouldn’t have it. I wanted NOVELTY NOVELTY NOVELTY because that’s how I roll, but there’s a reason why restaurants don’t completely change their menu every week. Also none of us have enough ideas to flip the menu weekly. Also food waste. Don’t do this. We also only had 3 sandwiches on the menu: The Breakfast Sammie, the Lox Sandwich, and a 3rd improvised option called Fancy Turkey. People were rolling up like, “really, just 3 sandwiches?” but being a professional Sandwich Genius is actually an incredibly skilled job and we were still learning. We couldn’t handle more. God bless that day in September 2017 when I met Claire — I still remember how fun it was to work with her, how much of a machine/beast she was (is!) and how excited she was to accept my job offer! Claire (and later Tracy, and now Jesus and Marc) was the primary reason we were able to expand our sandwich menu. I firmly believe working the sandwich line is the hardest job in the house and I treat them like star athletes. We also had a tiny countertop convection oven, a souped-up version of the one Borealis had for our pop-ups. I legit thought this would work for us. It was a DISASTER. But mostly for positive reasons: We do way more volume than I ever anticipated. That thing was never going to stay hot enough for us. In March 2018, we upgraded to an actual 1/2 size convection oven after I saw the one at Flour in Back Bay, Boston and the sweet Puerto Rican guys working the sandwich line assured me I could crank it all the way and it would withstand the abuse. They were right (for the most part). This new oven was a breakthrough for our speed of service and our sandwich sales skyrocketed. Yay! We also had a VERY limited assortment of pastries, 3 kinds on most days. And our pastry case was a humble 3-sided box I made out of plexiglass from Lowe’s. (Friends, remember: I was BROKE!) Our pastries looked like they were locked up in prison and the merchandising was not attractive. We upgraded to our current glass pastry case in March 2018 (and I want a new, prettier custom-made one now!) and we switched over to beautiful trays in Fall/Winter 2018 (first some graphic plywood ones from Stock, currently marble & brass ones from West Elm I found on supa-dupa sale). Better merchandising drives sales, eureka! We now have about 8-12 different pastries daily, rotated based on our bakers’ whim. I am like… 95% pleased with where we are with pastries at Rebelle and everything we do from here is just gravy/continuous improvement. Good job, team! More cringe illustrated below: Our roll-up security shades (idk what to call it), our CAGED door (walk in for a bagel and get locked up! ), our first outdoor furniture set (spray paint fail), our empty deli case (how sad), our bare walls. Obviously, we don’t look like this anymore. I was so swamped with trying to start a business, learning how to be a boss and how to deal with customers and setting boundaries and trying not to go insane. I didn’t have any time or energy (or money) to spruce up the joint until 6 months in. We’re now more comfortable financially and Michele holds down the kitchen so I can focus on improving the customer experience in every way. One of the first comments we heard when we opened was, “$4 for a bagel with cream cheese? !” Yes, we are aware that our prices are higher than other bagel shops. (I hesitate to say “competition” – our comparison set doesn’t actually include any bagel shops. But that’s a conversation for another day.) I’m here today to make a case for our prices. 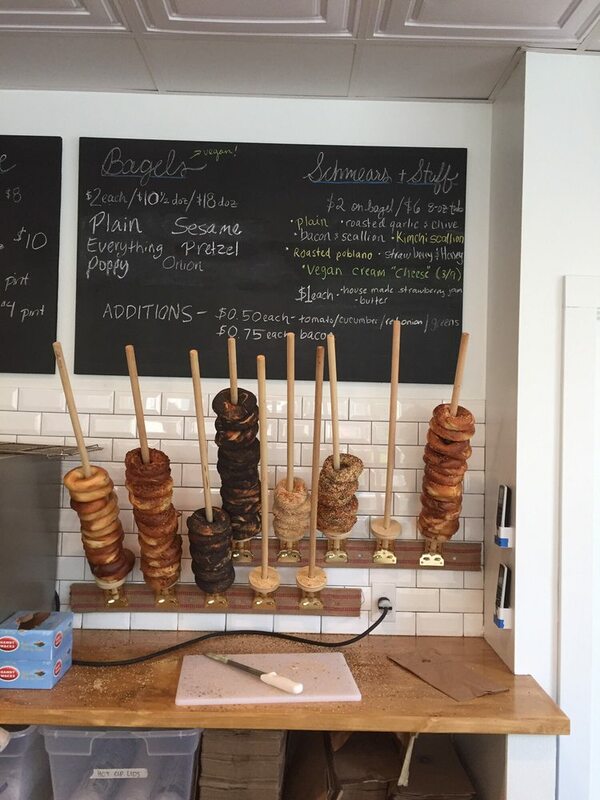 When I first dreamed up the idea for Rebelle, my husband Darcy and I visited many bagel shops in PVD and beyond to understand the bagel market. A bagel with cream cheese was about $2.50-3 but, in all honesty, that didn’t buy us a bagel we took pleasure in eating. The flavors in the cream cheese were barely there and the bagels themselves tasted bland and mass-produced. I knew we could give you a better quality experience. Quality is the product of a trade-off between what people are willing to pay for a product/experience, the cost of producing it, and the business imperative to turn a profit. (Come on guys, we all know why we’re here.) If people are only willing to pay $2.50 for a bagel with cream cheese, the product is designed with that constraint in mind. As far as I know, nobody has cracked the nut on how to do high quality/low price/killer profits/everyone is happy. I think whoever does will be a very, very wealthy person creating a lot of value for our society. Knowing what I know about making and selling bagels, I’d guess that a $2.50 bagel with cream cheese involves some combination of minimum wage/free labor, machines instead of hands, cheap bleached flour, and cream cheese with more stabilizers and emulsifiers than natural dairy fat. For now, I remain confused as to how other businesses make those low prices work. My guess is something or someone suffers in the process. I’m an Excel freak, so of course I built a model to illustrate the impact of lowering prices (see graph). The orange line is representative of our current labor & food costs, and you can see by the way it curves upward that the greater the price cut we want to implement, the greater the volume we have to sell to offset that. To reduce prices by 10%, we’d need to increase our total revenue by 50% JUST to match our current profits. That means we have to make and sell 50% more bagels to end up right where we are today. The gap gets more extreme as the price cut increases to 20%, and if we lowered prices by 30%, our business would be completely unprofitable no matter how many bagels we sell. You can’t volume your way out of zero margin. Thinking beyond the financials, operationally we can’t handle much more volume than we do today. We have a limited production capacity and on weekends we move through customers as quickly as we humanly can. A price drop would effectively lose us money. Some businesses deal with this pressure to lower prices by cutting food costs (lower quality or eliminate waste) or labor (reduce wages or work with a smaller team). Even if we reduced our food costs by 10% and also reduced our labor costs by 10% we’d still need a 20% volume increase to sustain a 10% price cut (gray line in graph). I shudder at the thought of paying minimum wage and buying cheap cream cheese full of stabilizers. At that point, what’s the point? Ultimately, you as consumers have the final say on our prices when you choose to visit us. We love that! I am grateful every day that you vote “yes” with your dollar and support what we do. The prices you pay afford us the opportunity to pay our team living wages, to support local coffee roasters and kombucha brewers and kraut & kimchi makers and even flour millers (! ), and to offer you sweet little details like a free daily copy of local and national newspapers and actual plates to eat off of. I think that’s worth paying a little bit more. In the beginning, getting me to make vegan cream cheese was like pulling teeth. I remember one of our regulars, Amy, coming up to me back in the pop-up days at Stock and begging for vegan cream cheese and I would think, “why in the world would anyone want fake cream cheese?” The thought of “foods masquerading as other foods” is strange to me. Tofurky is weird. Turkey bacon is weird. Margarine is weird. Tofu cream cheese is weird. I certainly never tasted one I enjoyed. See the graph above: The green line is the Vegan Dream and blue is our total sales. Obviously I deleted the axes/numbers because our sales data is proprietary information. But just focus on the incline of the lines relative to each other: the green line has steeper growth vs. the blue. After I saw @veganeats_rhodeisland post an amazing picture of @rebelleartisanbagels's Vegan Dream bagel sandwich with homemade cashew cream cheese, avocado, pickled daikon & carrot, onion, cucumber, and jalapeños I knew I had to have it so I rushed over with 10 min to spare before closing. So glad I did! I think another factor in our success with vegan options is just the awesome vegan community around us. So many of you have found us through Instagram and continue to spread the word about us! I recently received a postcard from Happy Cow celebrating our listing on their online directory of vegan-friendly spots in Providence. One of you must have created our listing on there — thanks for spreading the word! So this year we want to do more vegan options. It’s working for us. Certainly we are not turning into a vegan bakery! Wildflour does a great job with that, and I don’t think it makes sense for us to go in that direction. But our kitchen staff is becoming more conscious about making recipes vegan-by-default whenever possible. If we can make simple adjustments to recipes to veganize them (e.g. swap butter for oil in a soup) and it has little impact on flavor/texture/structure, we should do it. We now have 1 vegan pastry (a very convincing banana cake if you ask me! ), 2 vegan cream cheese options, 2 alt milk options and 1 vegan sandwich, plus our salads and soups are vegan a good chunk of the time. Tell me: What other vegan products do you wish we had? Do you have a great idea for a vegan sandwich? I want to share with you some of the ways we deal with random bits and scraps of things in our kitchen to spare them from the landfill. Our team does an amazing job getting creative and resourceful to avoid throwing out food. Maybe you’ll be inspired to adopt some of these practices! We repurpose items into something new. Here’s a secret: We take 2-day old brownies and crumble them into our Peanut Butter & Brownie cookies. We used to take day-old babka and turn it into babka bread pudding. We turn unsold bagels into bagel chips. We do this a lot, and so do a lot of restaurants, and so can you! We preserve. Wanna know how we came up with our pop-tarts? We had a bunch of berries that didn’t make it into fruit salads and they were about to turn bad. Too sad to see them go into the trash, we picked off the soft bits, washed the rest, and turned it into jam. This jam went into our pie dough and the rest is history. Now we actually make jam just for pop-tarts, because they’re so popular! Just to give you a reason to save scraps at home: Here’s the recipe for our famous tomato jam, which receives so many compliments, I should shut down the bagel shop and devote myself to jam instead. We use it on our BLT sandwich, and it also does a good job of dressing up a humble egg & cheese sandwich. Note: All our recipes are scaled by weight for consistency and repetition. You should consider buying a cheapo kitchen scale for your kitchen – ours are $10 from Amazon! We have to do something about selling out of bagels early. If there was one misconception about our shop that I wish did not exist, it’d be this: We don’t sell out all the time. We don’t! I have a complicated relationship with selling out of bagels. In an ideal world, we sell out of bagels maybe 30 mins before closing, TOPS. (The last 2 hours of service are typically slow for us.) Selling out near closing time gives us a bit more time to clean up at a chill pace, and the opportunity cost of lost sales is very low. If we sell out 2 or 3 hours before closing time, that’s good money we lose. Every time a customer comes up and we are sold out, I’m keeping track of every single sale we could have made. Darn it. We forecast our production a week in advance and feed it into our ingredient ordering process. To forecast, we look at what happened the weeks prior, which is captured in painstaking detail on our Daily Recap report. (Every morning, the bakers record the production by item, and in the afternoon we record what’s left.) We also look at our sales data from the year prior, especially if we’re looking at holiday periods. Sometimes we tweak the plan halfway through the week to accommodate crappy/nice weather, unexpected construction, etc. We don’t want to waste food. We never sell day-old bagels, so whatever doesn’t get sold that day is not held for the next day. There’s only so many bagels we can chip (we chip A LOT), donate, gift to friends or take home to eat for breakfast. I don’t like seeing food hit the trashcan. More than wasting food, it’s also wasting time that the team could have spent making other things! As an engineer, inefficiencies drive me totally bananas and this one in particular is a biggie for me. It’s the perfect trifecta of wasting time, money and ingredients. I just scrolled through our Instagram and counted our Sold Out posts. Fourteen in total for November and December. Out of 48 days that we were open, that gives us a 29% sell-out rate. That’s a far cry from “always” but I’d be lying if I said I wasn’t surprised. That blew me away a bit. No wonder people think we always sell out, we post about it every 3-4 days! I am sure a lot of people, especially those who aren’t on Instagram, don’t bother coming because they think we’re sold out. That makes me sad. We want to feed you bagels! We’ll post more frequent updates on our Instagram story: We’re going to set alarms on our iPad registers to take photos of whatever bagels are left, twice per day (maybe at 10 and noon?). We’ll timestamp the stories so you can always go on our profile and take a reasonable guess at where we are for the day. I think this is also going to act as a check for us: Are we frequently selling out before noon? Then we should adjust our production plan! We’re going to improve our production planning process: A few months ago, I learned more about regression models in business school and played around with our data long enough to realize the day of the week and weather conditions are closely tied to our sales. I need to go back to that model, feed it more data and train it. We should try baking to whatever plan the model gives us and see how it holds up. I think my fear of being wasteful can be mitigated if our production plan is better than guessing based on last week (just being real with y’all, what we do is on the level of educated guessing). Opening my own bakery turned me into a hyper-aware consumer, and now everywhere I go eat, shop, whatever, I totally pick apart in my head. What do I like and don’t like and why? What works and what doesn’t? Through this mental exercise, I realized I am really enjoying pretty spaces right now. I am getting lost in the little thoughtful details everywhere that add up to the personality of a place. We’ve done a lot of design changes to our front of house in the last 2 months. I started by wondering if I could rearrange the furniture for a better layout so we can fit more people more comfortably. Then I got a little carried away with all the inspiration I’ve been collecting. During Thanksgiving, we built new wood benches that rest against the windows and make the whole place feel like a cozy nook. I hadn’t thought about it before but sitting along the perimeter, facing the room, just opens it up so much! We love them so much, we plan on building a few more. A bonus: the outlets are also now accessible to twice as many tables as before. I spent 3 days on this bench plugged in, studying for my finals and enjoying the chill vibes at the shop. I encourage you to bring your book/work and take a long breakfast on a weekday morning! We changed the menu boards. I had 2 issues with the old menu boards: I couldn’t take them down to update them, and they were in cursive. 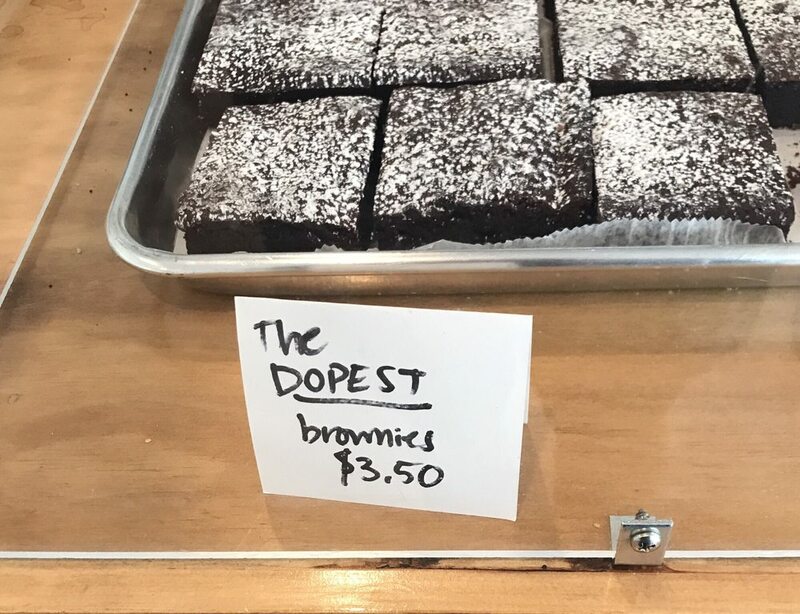 Turns out cursive is hard to read quickly and from an operational standpoint, we really need people to read the menu and quickly figure out what they want to order. The new boards now hang from a rod (!) and are written in sharp block letters. It’s taken us a few days to finish this one because the old ones were glued to the wall, so patching things up and giving the wall a fresh coat of paint takes way longer than we can work in one go. We changed the countertops. The old plywood counters had sentimental value to me, since I spent 2 weeks sanding, staining and sealing them before we opened and daydreaming about what operating this place would be like. But they were degrading quickly (especially the one near all the coffee) and our accountant encouraged us to invest in meaningful upgrades. We now have beautiful, shiny stone counters, with trash cutouts for your convenience (!). We’re still waiting on one final piece of countertop so we look kinda mismatched at the moment. Oops. We installed a plant wall. I am obsessed with the houseplant explosion at The Nitro Bar. I went a bit wild buying these wall-mounted planters and stuffing them with ivies. I can’t wait for them to grow in! We’re going to add more houseplants around the room. One of our 2019 goals is to continue prettifying the space, so you can expect to see more changes in the coming months. (Especially in January, since I don’t have school and can focus on DIY projects!) I’m curious to hear how you like to use our space and what upgrades can make it a more enjoyable experience! Will we be the first in Providence to pay employees a cut of profits? Anyway, I have a lot of ideas in that document but it’s not crystal clear how we get there. I can’t raise our prices 10% every year to pay for raises and benefits, so giving our employees more while keeping our prices relatively stable requires creative financial acrobatics and being militant about operational efficiencies. Tough balancing game. But I think we’re figuring it out just fine. It’s time to give back to the crew that makes the magic happens! We’re going to start giving our team a cut of the business’s profits. This is called profit-sharing, and it’s all the rage right now, and as far as I know we’ll be the first restaurant in Providence to offer this benefit. I’m not trying to gloat — but I think this is a BIG DEAL. I hope this will be successful for us and that other business owners will follow along. Here’s how it will work: Every 3 months, we will put 5% of the profits into a “pool” that all employees will share, disbursed according to hours worked. It will function just like our tip pool, but funded by the business. As a retention incentive, team members have to be with us for 6 months before participating in the pool. If I did my math right, this benefit will amount to about 1 week’s paycheck as a bonus every 3 months. For Q1 2019, our profit sharing program will be a test (and has been communicated to the team as such). My deepest hope is that it will improve our retention rate, create long-term engagement within the team and make them feel better compensated for their work. Don’t be nervous: We’re not paying for this or our upcoming 6% wage increase with price increases. In the short term, we’re absorbing the cost. And in the long term, I am hopeful our growth will continue into 2019, and that we’ll be able to keep and expand this program with your support. I ask you to consider this as you decide where to eat your breakfast, where to grab your morning coffee, or where to order holiday treats. Every dollar you spend is like casting a vote in support of business practices. I hope you will vote more often with us! I took this photo on November 7th, the day when we made our first batch of soup at Rebelle. We’ve been slowly pushing over the last few months to become more than just a bagel shop, and pushing for lunch is part of that. 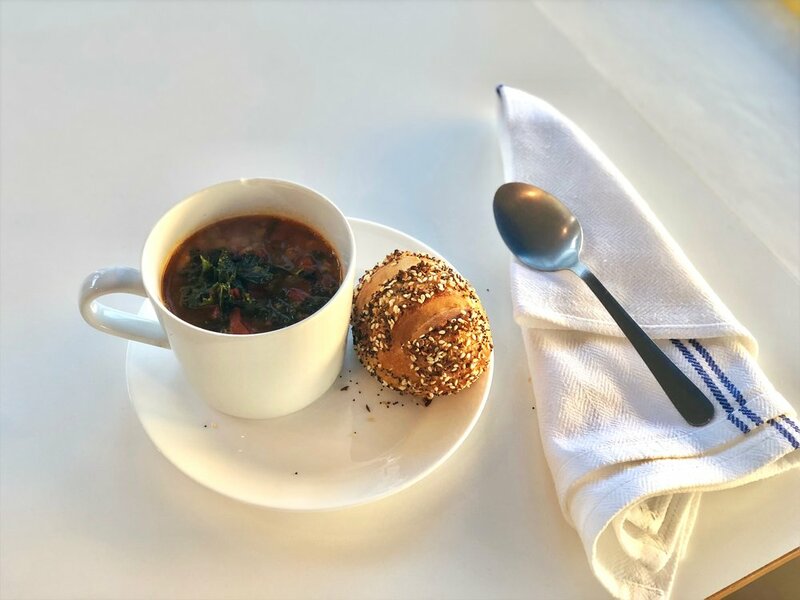 I recently had soup for lunch at Tatte in Kendall and it was a nice, healthy, warming meal, and the $5 price tag was just right. I wanted soup at Rebelle. You wanted soup at Rebelle! This was fated to succeed. We had some chorizo bits and pieces from our Spanish Tortilla sandwich special that were begging to be put to use, so we made Chorizo, White Bean & Kale soup and put it in a $80 soup kettle from Restaurant Depot. Because the soups would be a vehicle for bits and pieces of things that would otherwise be deemed “scraps”, this was a very low-risk experiment. At $5 a piece, we needed to sell 16 soups to earn back our “investment” on the kettle. Easy! Not so easy. We’ve sold a grand total of 15 cups of soup since launch. We don’t put the soup kettle on during weekends, because at noon on a Sunday people are still thinking breakfast. So the soups are only a weekday thing, but it’s still painfully slow movement on a new item at an average of 1 unit sold per day. No visibility: We’re keeping the soup kettle in the back for practical reasons (not much counter space in the front). But I think we have to try putting it in the front! We didn’t give it enough time: We try to give new items at least a month before calling them dogs and retiring them. Given that the soup is only a weekday item, we should probably give it longer. We didn’t market it well: We haven’t given soup the spotlight to shine on our emails. We’ve launched other items successfully by sending coupons to drive trial. We should try that again! For this week, the soup is on hiatus as I do some soul-searching. We’re going to make a cream of mushroom soup next week. Will you please come try it? We hope to see you! We’ve been training new bakers Sky, Anna and Lauren for long enough that I’m afraid they’ll leave us if we don’t open 7 days a week soon. So here we are! We’re testing service this Monday 12/10 and Tuesday 12/11 from 6:30 am to 3 pm. We’re a bit nervous but very amped to see if this helps us meet your needs, grow our business and not lose our minds! We now have a blog! Inspired by Clover Food Lab, I have decided to start a blog for us at Rebelle. Clover recently turned 10 years old and hitting such a big milestone gave them an opportunity to reflect back on their history through their blog. It’s hard to imagine making it to 10 years in business, especially when we picked an industry with such a high failure rate, but that’s what we’re hoping for: a moment when we’ll want to reflect back on our successes and failures (which I hope document here in a very candid fashion). I also want to use this blog as a way to reach out to our customers and other budding entrepreneurs. We imbue everything we do here with a heavy personal touch (our marketing emails are written and signed by me) and having a blog where we can document our thought process around how we run and grow our business will hopefully bring us closer to our customers. Y’all have a question or idea to share? I’m always on email! And for entrepreneurs, we know there is just no blueprint for how you start a business. We all make it up as we go. But I learned (and still learn) a great deal by watching what others do. My biggest hope is that, in some distant corner of the universe, someone is reading this blog, working up the courage to start their own business or learning from our mistakes.